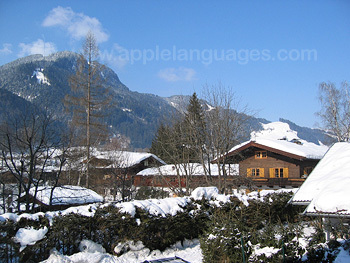 Learn German on a course abroad at our language school in the picturesque town of Kitzbühel, in the heart of the Austrian Alps. Famous for the Hahnenkamm downhill ski race and the Austrian Tennis Open, Kitzbühel is one of the most attractive mountain resorts in Europe, offering an extensive ski area in the winter, and beautiful mountain walks to enjoy in the summer. 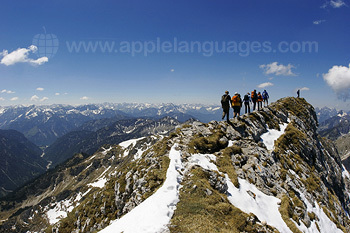 With its traditional Tyrolean atmosphere, Kitzbühel is a beautiful location to learn the German language, and a great base from which to explore the Alps. Kitzbühel is a great base for students hoping to combine their German studies with skiing, as the school is close enough to the ski slopes to able to study in the morning and ski every afternoon. The school's director is an enthusiastic skier and is always happy to provide advice about life in Kitzbühel and its surrounding areas! 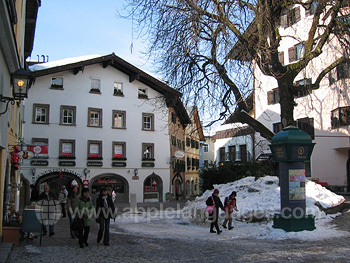 Our school in Kitzbühel is located in a leafy suburb just 15 minutes’ walk from the town centre. There are shops, bars and restaurants within easy reach of the school, as well as a riding school and tennis courts for students with an interest in sports. Anyone with a love of skiing can benefit from the bus stop right outside the school, which takes you directly to the slopes! This is a small school which prides itself in offering a high standard of tuition, a friendly atmosphere and a personal service. With a maximum of just 4 students per group class at our Kitzbühel school, students learn German quickly and receive lots of personal attention. 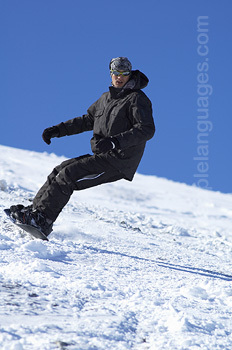 The Intensive German language course includes 20 lessons each week, ensuring that you make rapid progress with your German but still have enough free time to explore Kitzbühel, go skiing/snowboarding, or just relax and enjoy the beautiful Alpine scenery and lifestyle. If you are aged over 50 and prefer to learn German with people of a similar age, our school in Kitzbühel runs a German Club 50+ Course. This course runs twice a year, usually in June and September and includes bed and breakfast accommodation, German lessons every morning, as well as an activity program of social evenings, afternoon walks and guided visits. If you prefer individual tuition, you can take a course of Private Lessons at our school in Kitzbühel. This course is the perfect choice if you have specific requirements relating to your German tuition, or if there are certain things that you wish to cover. 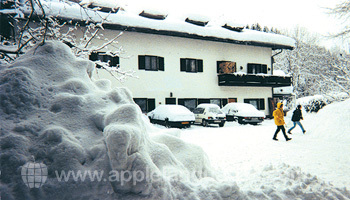 Our school arranges accommodation in Kitzbühel local guest houses. Several options are available, but we recommend a small guest house located close to the school where a friendly Austrian Frau provides a warm welcome to students. Guest house accommodation includes breakfast every day to set you up for the day ahead! Whilst our school in Kitzbühel does not offer a set activity programme, the school staff are very friendly and happy to make recommendations about things you can do in your free time. This is also an excellent location if you wish to ski in your free time, as the school’s director is an ex- ski instructor and regularly takes students skiing! 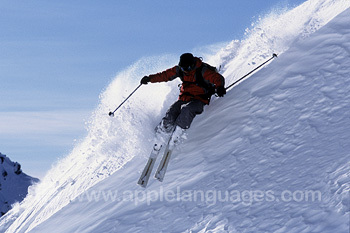 He is an expert on the best places to ski in the local area. To reach Kitzbühel, fly to Munich, Innsbruck or Salzburg . We will be happy to make recommendations about companies offering transfer to Kitzbühel. Average score for our school in Kitzbuhel based on 22 previous client reviews. The course was good with an experienced, conscientious teacher who was well-prepared and had a good sense of humour. The ratio was very good, three students to the one teacher. The lessons were good fun. The director Hans was very friendly and ensured that we all went out for three evenings, driving us into town. 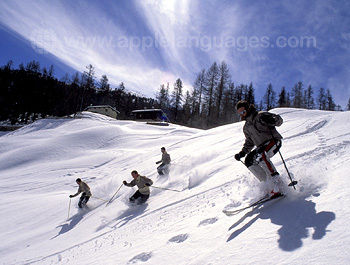 Kitzbühel is a perfect place to combine skiing/snowboarding and learning German. 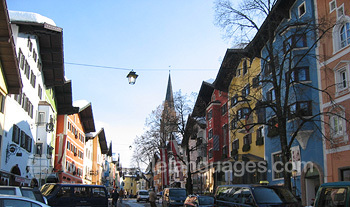 This was my second time at the language school in Kitzbühel and likely not the last one. 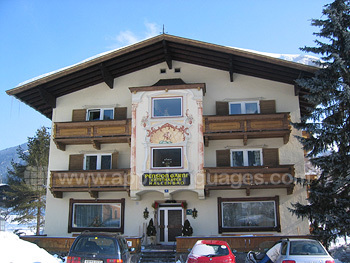 The accommodation was close to school and the distance is walkable to the centre of Kitzbühel. The Ski lifts are easy to access with ski busses. The accommodation did not have internet access. The reservation with Apple Languages was easy and it was also possible to have flexibility to standard one week accommodation. The course was very interesting and Hans, the teacher was really very good. My level wasn't so high but he succeded in making me following the lessons. The course was very lively and interactive. My teacher Hans was very professional - long years of experience showed that he "knew his job". The number of other students sharing the class was small and I regretted not having been able to have any of my co-students accompany me skiing in the afternoon. Really enjoyed the whole experience and Hans was a superb teacher. Excellent accommodation with very welcoming hosts. This is the second year that I have been there and am writing to let you know that it is an excellent course and very student focussed. I have been on a number of German courses and find the Kitzbuhel course offered by Hans is by far the best. He has an excellent teaching technique and is prepared to spend a significant time socialising with students which really helps reinforce the language skills. Loved the course! Hans and Doris created a friendly environment that allowed for intensive language learning and fun. I especially enjoyed the combination of classroom with outside program learning. This combination provided classroom structure for learning grammar and phonetics, along with local excursions for practice in speaking - as well as site seeing! Thank you Hans and Doris - I had a super time!!! I stayed at the Hotel Garni Entstrasser, a short 5 minute walk from the school. Klaus, Annegret, and Bettina are wonderful people who made my 3 weeks stay at their lovely hotel a delight. Very friendly people who create a warm and cozy environment. My room had a balcony and of course, was surrounded by mountains - what a fabulous view! Nice selection for breakfast and very happy to have WiFi. Needless to say, it was hard to leave this wonderful hotel that was my home for 3 weeks. Kitzbühel is a vacation delight! So much to do from hiking to sipping coffee at a Cafe. Very picturesque - a photographer's dream! The course was excellent. The teacher (Hans) was extremely knowledgeable and very patient. I learned a lot and found the course extremely worthwhile. My accommodation was in a great location, across the street from the school. The owners of the guesthouse were extremely friendly and each morning the lady owner would join us at the breakfast table for conversation in German. Much appreciated! The breakfast was also very good. The staff were encouraging and helpful and the course was tailored to my individual needs. Excellent instruction. Good balance of instruction and social Interaction. Very hospitable hosts who spent time reinforcing the language classes in a social setting. The course was excellent. I learned so much in my time there. The teachers are extremely friendly and glad to help you whenever they can. The afternoon programs in the school were also very nice; skiing and hanging out in a local restaurant. Both of these afternoon times were not only fun but also another great opportunity to practice the language. I had an apartment the whole time that was very clean. It wasn't too far from the school or the town, so that made getting around nice. It had a nice little kitchen so I could make some food for myself, rather than having to eat out all the time. The owner of the place was extremely helpful, she would do my laundry for me every week and take me back and forth to the train station. Wolfgang was an excellent tutor. He was laid-back but sussed all the time if anyone was not following and dealt with it in a very sensitive way. There was a good balance of grammar lectures and exercises and chat from the tutor about life in general. I had a large bedroom in a private house. 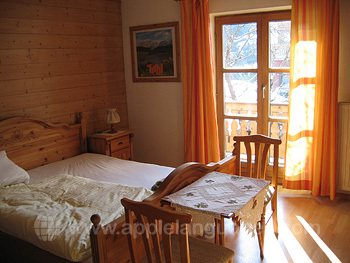 It was well-equipped and had a balcony but was situated right on a busy road leading out of Kitzbuhel. Tuition was very good. Friendly, helpful teachers. As a complete beginner I found that there is only a certain amount one can take in during one day and 2 hours of one-to-one tuition was a realistic maximum. I learned a lot in just 3 weeks. The instruction included a lot of "every day smalltalk". So the common words and sentences became quickly known. Austrian people are in common very friendly. Also my host and hostess. They liked to get to know all their guests, in german of course.